Deep in the mountain forests of Southern Appalachia lives a mysterious group of mixed race and unknown origins. While myths and folklore abound, they are labeled pejoratively with one word: Melungeons. Fifteen-year-old Silas Vanover is thrilled at the chance to make a life for himself as a trader among the white settlers. But his optimism is crushed by his family’s horror stories of lynchings, excommunication, and worse. Determined to prove them wrong, Silas ventures down from his isolated colony to trade in the valley below, attempting to pass himself off as a member of an Indian tribe. There he meets Amadahy Kingfisher, a Cherokee girl who notices how out of place he is in town but still extends kindness and curiosity toward him. The two make a deal to befriend one another for their own protection among the hostile European frontiersmen, and their encounter makes Silas hopeful that his people’s haunted memories are scarred legends of the past. But he is mistaken. After being wrongfully accused of a crime by the white settlers, a brutal raid on his people’s beloved mountain enclave destroys everything Silas holds dear. Now he must fight for his home, his identity, and his place among the people of East Tennessee, forming alliances with the white settlers and the remaining Cherokees of the area while trying to stay true to his own people. In the end, Silas must decide where his heart and loyalties lie as the white government sets into motion what will later be known as The Trail of Tears. 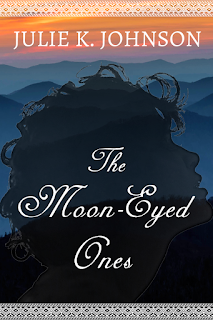 The Moon-Eyed Ones is available now in ebook and print format on Amazon. 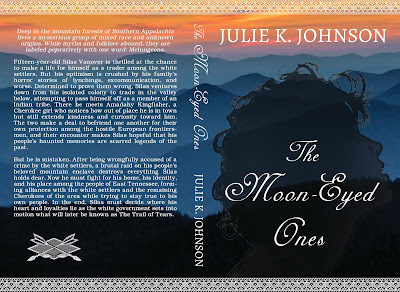 Add it to your shelves on Goodreads and check out Julie's website to read the first three chapters and learn more about the book!